To all the trails that life has thrown at us, there has always been one man who stood solid as an anchor behind. He is my father, Singaravelu. He is 58 years old now and fighting a tough battle to come back alive. He has been suffering from severe diabetes which has led him to go unconscious and been in Intensive Care Unit for over a week now. He underwent an open heart surgery nearly four years back and lost one of his legs to gangrene two months back. We are a family of three daughters and a loving mother. We have ploughed in all the available resources for his medical expenses which have exceeded all our might and strength. This is a request to donate as much as u can, which would not only save a life but would save a family from an impending doom. 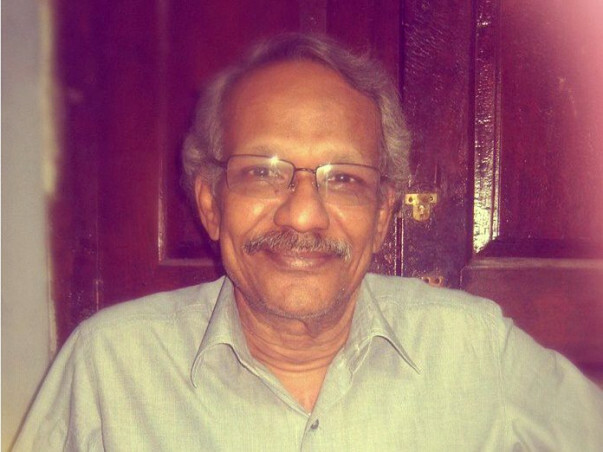 Our father underwent Open Heart Surgery on 19.03.2013 at The Madras Medical Mission Hospital, Moggapeir East, Chennai, Tamil Nadu. We spent around INR 3,75,000/-. The surgical decision was solely decided by our father. After post-surgery, he was hail and healthy until August 2017. During the month of August 2017, he was diagnosed with cellulitis in his left leg. His conditions worsened and he started to lose his consciousness. We admitted him to the Madras Medical Mission Hospital, Chennai on 04.09.2017 and underwent surgery and lost his left leg due to cellulitis. The same cost us approximately INR 6,00,000/- (inclusive of Pre and Post-hospital expenses). He then moved to Salem (his nativity) to lead a normal life and all of a sudden everything went upside down. His sugar levels started fluctuating and were given treatment at a local hospital. 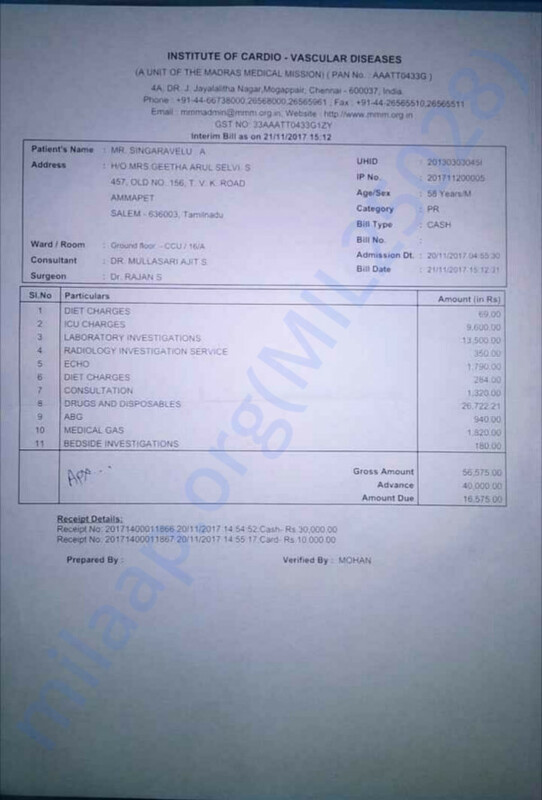 On 13.11.2017, he lost his consciousness and was shifted to a SKS Hospital India Private Limited at Salem where he was given care at ICU and there seemed to be no improvement in his conditions even after treating for 7 days in ICU and costed us INR 1,36,950/- (inclusive of ICU charges, Doctor consultation and excluding Drugs which we bought from the hospital pharmacy, as per the hospital instructions, daily for INR 10,000 approx per day for 7 days). The Doctors informed us that the best treatment available in Salem and in SKS has been provided to the patient, and informed us that in spite of the same his BP and pulse were dropping and would continue to worsen. Hence, we decided to him back to MMM on 19.11.2017 around 10.30 pm. Later the same day we started from Salem to Chennai along with our father in an ambulance to Madras Medical Mission. We admitted our father at The Madras Medical Mission Hospital, Moggapeir East, Chennai, Tamil Nadu on 20.11.2017 at 3.30 am. 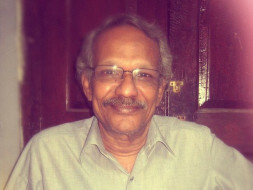 His treatment is going on and he has been diagnosed with Stage III bedsore along with Infarcts Brain (A cerebral infarction is an area of necrotic tissue in the brain resulting from a blockage or narrowing in the arteries supplying blood and oxygen to the brain) and being treated in Coronary Care Unit (CCU) in the hospital. His bedsores have to be dressed with Vacuum Dressing Technique and support for the same is being given externally by wound specialist as it happens only in the rarest of the rarest cases and costs INR 13,000/- for each dressing. The procedure has to be repeated at least 6-7 times. His CCU costs (inclusive of Diet, Laboratory Charges, Drugs & Disposables, consultation charges, ABG, Medical Gas, Bedside Investigations and ICU charges) costs approximately Rs. 25,000/- per day. He is being given liquid foods through the nose as normal feeding is not possible due to his mental instability (semi-conscious condition). Doctors are serving their best to treat him and improve his overall health conditions. It seems to cost Rs. 12,50,000/- (approximately) for our father as it is fully a treatment with drug support. Further, the doctors have advised us to treat him in CCU till his general health condition improves and gains physical and mental strength. 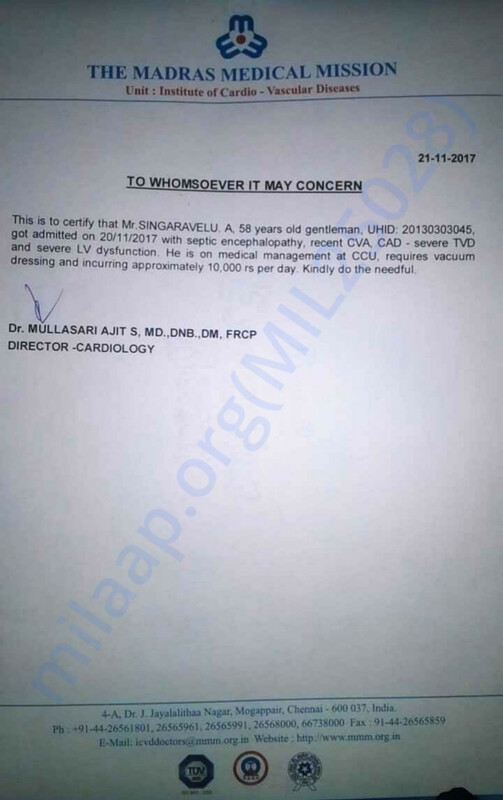 We have attached a letter given by Dr. Mullasari Ajit, Director - Cardiology, Madras Medical Mission, and the approximate bill break-up for two days. We whole-hearted request all the kind souls to contribute as much as you can and it is small drops that make an ocean. We thank each and every person who contributes in order to help our father to regain his health conditions both physically and mentally. Also, we assure all the people that the amount contributed shall only be used for his pre and post-treatment expenses and not for any other personal purpose. This is to inform with a heavy heart that the patient, Singaravelu. A - our father - for whom this fundraising was started has expired due to the failure of treatment. The doctors did their level best to recover him (perhaps, I should even say that they have been Godly in the treatment they rendered) but due to sustained complexities, weak immunity, and continuous infection that spread to the blood due to the bed sore, his heart's rhythm slowed down. The doctors gave him procedures to cure his bed sore (Stage -3 which caused the blood infection) by obtaining the advice of a wound specialist but it failed due to my dad's multiple complexities. His condition worsened in the last two days of his treatment and he became unresponsive towards the end. Even in the last minute, we moved him to the ventilator and the doctors tried CPR thrice on him to revive his heart but only in vain. I heartily thank each and every soul who contributed their money and thanks a lot for your prayers. I couldn't thank much more for all your support. This has given me a hope that this world is not too bad, that as a family we are not abandoned or left alone, and that my dad went out of his good earth with the blessings of all the good hearts out there. Much indebted to everyone here. And thanks a lot to Milaap for their support. I couldn't have asked for more. We are using the funds raised here only to pay off the bills of the hospital incurred to meet dad's treatment. I would like to add further that at the last minute we tried to donate dad's eyes but the proposal was declined by the doctors due to his blood infection. I assure that I would repay this society in some way or the other for all the help and support is provided. Much indebted and so much thankful. Thank you for all the support you have shown my father so far. He is doing better now compared to earlier. He was critical when he was hospitalized on Monday (20th November) and was being administered treatment and tests were being conducted. The results indicated that he has a clot in his brain and he is showing improvements now. The medication he is being administered is helping to reduce the clot and he has regained consciousness. He is able to open his eyes, smile, move his hands and legs etc. He is trying to speak but is not able to gather the strength. The doctors suggest that he will be on medication for a few more days and after that, they will conduct a few tests based on which they will be ascertaining the future course of action. Thank you for all the support once again. Would request you to please pray for his health and speedy recovery. Please do share this campaign further with your friends and family.